What a week – wow! Rachel taught a warm-up class on Monday and sections of the warm-up were also taught by me and the Anjali dancers. Then we split into two separate teaching teams and I worked with Nick and Jason to create a lesson plan. 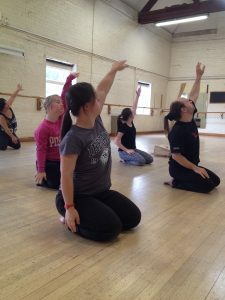 We each took on a role such as dance leader, dance support or demonstrator and we taught the other half of the company and received feedback. We then planned a workshop for our weekly Open Class all together. When I taught the Open Class I had support from the others and it all went well. My voice projection was better and my confidence has built up well. I taught well and loved it. Everyone now believes in me. The following day we looked at cool-downs and each company member taught a small section of cool down. On Wednesday we looked at safe touch and improvisation and making and setting contact duets which will help with future workshops. I had individual feedback from Rachel with personal things to work on. Rachel thinks that I am doing well and I really enjoying our work together.